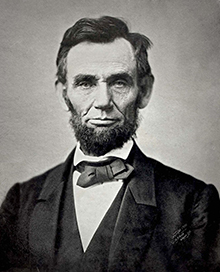 With the 150th anniversary of the death of President Abraham Lincoln coming up on April 15, the Emory Center for Digital Scholarship (ECDS) has updated its Lincoln Logarithms project website to include downloadable sermons that were given after his death. Lincoln was shot on April 14, 1865, by John Wilkes Booth and died the next day. The Lincoln Logarithms project, launched in 2013, examined 57 sermons given by preachers in the North and South after the assassination, using four digital tools that included text mining, mapping and topic analysis. That collection of texts, called “The Martyred President: Sermons Given on the Occasion of the Assassination of Abraham Lincoln,” was digitized by the Lewis H. Beck Center (now part of ECDS). Emory scholars investigated whether using digital tools to analyze a collection of sermons might uncover patterns or new insights about Lincoln's memorialization. Site visitors who want to read the sermons or try out the tools themselves can now download a zip file with all of the sermons, accessible via a sidebar on most of the site’s pages. The files are available as plain text and as TEI/XML, a text-encoded format containing semantic markup and metadata. To find out more about what the scholars learned, read some of the historical sermons, or get inspired to use these digital tools for your own research, visit the Lincoln Logarithms website.